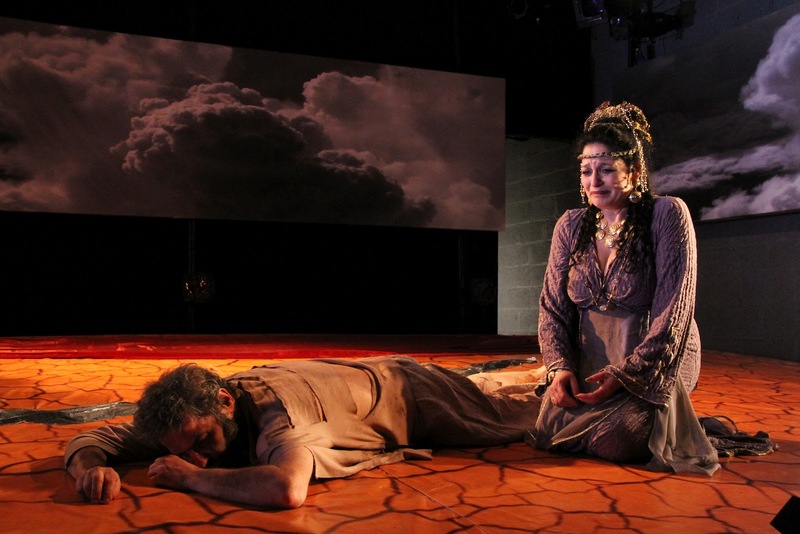 Last year, the Phoenix Theatre Ensemble, located at 195 East 3rd Street, launched a three year celebration of ancient Greek drama, selecting for its first production, Euripides’ Iphigenia at Aulis. Directed by Amy Wagner, that play, starring Joseph J. Menino as Agamemnon, Elise Stone as Clytemnestra and Kelli Holsopple as Iphigenia, was the first of three plays, all relating to the story of Agamemnon, that Phoenix would perform sequentially in 2011, 2012 and 2013. (The other two, I mistakenly believed, were to be Aeschylus’ Agamemnon and Sophocles’ Electra.) Iphigenia in Aulis was a deservedly great success and, having enjoyed it immensely (see my review of March 4, 2011), I’d eagerly been anticipating this year’s production of Agamemnon. Now, having just seen this year’s offering, I must say that I was a bit surprised and a bit disappointed but, at the same time, very satisfied. For starters, contrary to what I had thought (my mistake, I’m sure, and not the Phoenix’s), what the Phoenix is staging this year is not a revival of Aeschylus’ Agamemnon after all but, rather, the world premiere production of Agamemnon Home, a play by the very talented British playwright Glyn Maxwell that is based on the original tragedy by Aeschylus but takes considerable liberties with the original work. Consequently, it is quite a different kettle of fish from last year’s Iphigenia in Aulis. To be sure, both plays were very ably directed by Amy Wagner, Joseph Menino again plays the role of Agamemnon, and Elise Stone again plays Clytemnestra, but Wagner’s direction and the personae of both characters are quite different this time around. Agamemnon is not the heroic figure we’ve come to expect and, in his relationship with Cassandra (Kelli Holsopple, last year’s Iphigenia), his concubine and war prize, once a princess of Troy and an oracle whom no one believes, he tends to confuse her with the daughter he sacrificed. In sum, one might say that last year’s work, relying on a fine translation of Euripides’ tragedy, was an excellent revival of a Greek classic whereas this year’s production, as a re-working of an old theme, is both more and less than that. As one who enjoys good revivals of the Greek classics, I was sorry not to be seeing Aeschylus’ Agamemnon. In general, I prefer not to see the classics tinkered with. But this re-working of the Aeschylus theme by Maxwell and its production by the Phoenix Theatre Ensemble were so good that I still very much enjoyed the play. The plot line of Iphigenia in Aulis is this: Helen, the wife of Menelaos, King of Sparta, has run off to Troy with Paris, a Trojan prince and all of the kings and leaders of Greece, including Agamemnon, Menelaos’ brother and King of Mycenae, have joined with Menelaos in a war against Troy to retrieve her. Agamemnon has been appointed commander of the combined Greek forces but they are unable to set sail for Troy because there is no wind to power their ships. Kalchas, a soothsayer, suggests that the goddess Artemis has withheld the winds and demanded the sacrifice of Agamemnon’s daughter Iphigenia before she will allow Agamemnon and his troops to set sail for Troy. As the play draws to a close, Iphigenia is sacrificed, the winds blow, and the Greeks set sail for Troy. As Agamemnon Home begins, it is a decade later. A lone Greek watchman on a clifftop outside Mycenae, Greece, (Craig Smith, the founder and co-artistic director of the Phoenix Theatre Ensemble) has been scanning the horizon night after night, hoping to perceive a pre-arranged signal - a bonfire lit on Trojan soil - that will mean that the Greeks have won the war. And there it is! Which means that Agamemnon and his men will finally be returning home. Unbeknownst to him, both Agamemnon and Cassandra have already washed ashore. Before long, another lone survivor (Josh Tyson), shipwrecked but now home from Troy, washes ashore as well. At which point, it only remains for Clytemnestra to resolve her relationship with Aegisthus (Brian A. Costello), Agamemnon’s cousin and Clytemnestra’s lover in his absence - and to wreak her vengeance on Agamemnon for having killed their daughter. In Maxwell’s rendition, Smith plays the role of the watchman in a droll, comedic manner, which lightens the mood of the play beyond anything we’d expect of Aeschylus. Maxwell has also recruited the watchman’s three daughters, Photina, Thena and Alala (Amy Fitts, Zoe Watkins and Brittany Pooler) to act as a Greek chorus, an imaginative re-invention of the classic Greek conceit which works very well. But the real star of the play is Elise Stone who channels Clytemnestra with a range and depth of emotion that makes this production truly memorable – even if it’s not the original Greek tragedy. 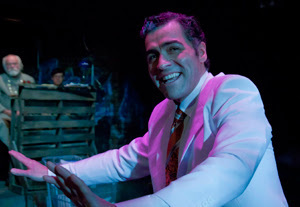 Eliud Kauffman as Yusef El-Fayoumy in THE LAST DAYS OF JUDAS ISCARIOT. Photo Credit: Daniel Terna. On Sunday, I saw T. Schreiber Studio & Theatre’s excellent revival of Stephen Adly Guirgis’extraordinary play, The Last Days of Judas Iscariot, a play which raises a great many more questions than it answers – but that is as it should be since the questions are of the deepest import and have vexed philosophers and theologians for centuries. If God is omnipotent, omniscient, and omni-beneficent, how is one to explain the presence of evil in the world -whether it be the evil of deaths brought about by such “natural” disasters as earthquakes, floods and plagues or those attributable to such human psychoses as war and murder? And if man is to be held accountable for his role in perpetrating evils of the latter sort, ought not God, Himself, be held accountable for his role in perpetrating evils of the former kind? Indeed, why should man be held morally accountable for any of his actions anyway? If God is omniscient, He knows everything that man will do and if He’s omnipotent he certainly could have created man in a manner which would not have led him to do the most abhorrent things of which he has proved himself capable. But since God created man as what he is, isn’t it really God, Himself, not man, who must bear the moral responsibility for man’s actions? There just doesn’t seem to be any room for man to have Free Will, if God knows everything that’s going to happen even before it occurs, and if it was God who was responsible for having created all the agents who brought everything about in the first place. So we’re left with an incoherent mix of purported Godly attributes – omnipotence, omniscience, and omni-beneficence – at least one of which is simply inconsistent with the other two. And we are left with a purely deterministic or fatalistic world evolving strictly in accordance with God’s own plan, in which it makes no rational sense to hold any man morally responsible for his actions. Which brings us to the play at hand. Guirgis has conjured up a place called Hope in downtown Purgatory, midway between Heaven and Hell, where the souls of the departed who are ultimately destined to wind up “above” or “below” may appeal their fates. And on this day, it is Fabiana Aziza Cunningham (Adyana de la Torre), the feisty agnostic defense attorney representing Judas Iscariot (Steven Carrieri), who is there to plead her client’s case before Judge Littlefield (Bud Stafford). Judas is in something of a catatonic state, uninvolved in his own defense, and simply awaiting transference from Purgatory to Hell. But if, in fact, the crucifixion of Jesus was part and parcel of God’s plan to save Mankind, why should Judas be punished for the role he played in betraying Jesus to the authorities who crucified Him? At worst, shouldn’t one say that Judas, lacking Free Will, simply played out the predetermined role that God scripted for him and we certainly can’t hold him morally responsible for that? And if, despite the logical inconsistency it would seem to entail given our theological presuppositions, we still choose to attribute Free Will to Judas, shouldn’t we revere him for assisting Jesus in fulfilling His plan, rather than condemning him for it? And if Judas were to be held morally responsible for betraying Jesus, and if such behavior were deemed contemptible notwithstanding its leading to the fulfillment of God’s plan, why shouldn’t an all-merciful God forgive him anyway? Moving right along, is it really Judas who should be held most responsible for Jesus’ crucifixion? True, enough, he betrayed Him but did he know that that necessarily would lead to Jesus’ death? Wasn’t Caiaphas the Elder (Ben Prayz), the leader of the Sanhedrin who turned Jesus over to the Romans even more culpable than Judas? Or is that anti-Semitism rearing its ugly head? And wasn’t Pontius Pilate (Omar Bustamante), the Roman judge who meted out the crucifixion sentence, and yet who went on to be recognized as a saint by the Ethiopian Orthodox Tewahedo Church in the Sixth Century, the most culpable of all? Cunningham is a fierce advocate but she may have met her match in her adversary, the pandering prosecutor Yusef El-Fayoumy (Eliud Kauffman), who comes closest to stealing the show. Between them, Cunningham and El-Fayoumy call upon an exceptional array of witnesses including, in addition to Caiaphus the Elder and Pontius Pilate, such strange bedfellows as Sigmund Freud (Alex Crow Riemers), Mother Teresa (Julia Kelly) and Satan (Stephen Alan Wilson) as well as several of Christ’s Apostles including Peter (Tommy Buck),Thomas (George Mouriadis), Simon (Brennan Vickery), and Mary Magdalene (Rebecca Spiro). Along the way we also meet the angel Gloria (Morgan McGuire); the self-described nagging Saint Monica (Erica Lauren McLaughlin); Judas’ mother Henrietta (Julie Szabo); Butch Honeywell, the foreman of Judas’ jury (Benjamin Jones); the court’s Bailiff (Michael J. Connelly); and, of course, Jesus of Nazareth, Himself (Alexandra Turshen). They all have important roles to play and they play them very well but the evanescent McGuire and trash-talking McLaughlin turn in the very best performances. If this play were nothing more than an intelligently structured philosophical and theological think piece, that still might be enough for some theatre-goers - but not necessarily for all. Fortunately, however, it is much more than that. Guirgis has written his play in as street smart, trash talking, politically incorrect and irreverent a manner as one might imagine but, at the same time, he has created a work that resonates with a belief in God’s forgiveness and mercy and man’s ultimate redemption. To be sure, there may be some whose ultra-orthodox or very traditional religious convictions may cause them to take umbrage at some of the play’s earthy language but I’d suspect that most people – and that would include both non-believers and believers with more modern religious sentiments alike - will find this play to be not only provocative but great fun.